Settled between the two holy rivers of Ganga and Yamuna, Dehradun is a mesmerising city that is known for its scenic beauty. It is located on the foothills of the Himalayas in the Doon Valley. 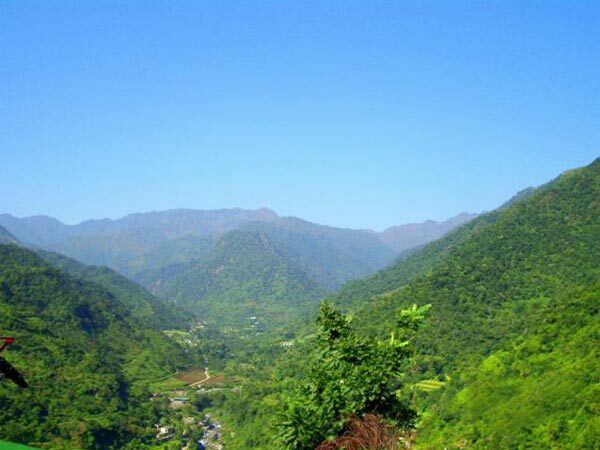 Dehradun, the capital of Uttarakhand, is one of the most popular tourist destinations of the state, which is well connected to other tourist places like Mussoorie, Auli, Haridwar, etc. Dehradun is derived from the two words "Dehra" which means "home" and "doon" is the valley that the city is nestled in. Historical significance of the city is in the Hindu epic Mahabharata, where it is believed that Dehradun was where Dronacharya was born and lived. Dehradun is a city that is perfect for people of all interests, since it is dotted with temples, filled with adventure activities, such as paragliding, skiing, river rafting, and finally, spread with stunning landscapes that will certainly intrigue nature lovers. Summer months of April to June are the perfect time to visit Dehradun, since the weather is beautifully pleasant during this season. Heavy rainfall during monsoon makes it unsuitable to visit between July to October and winter's freezing cold climate might not be the best experience either. At a distance of 28 km from Delhi lies the small town of Sonipat, which is believed to have formerly been known as Svarnaprastha. A popular legend believes that the town belonged to Raja Soni, who happens to be the descendant of Arjuna. Some places you can visit in and around Sonipat include Mosque of Abdullah Nasir and Tomb of Khwaja Khizr. Try the town's special food item called Ghevar. Saharanpur falls on the way to Dehradun, at a distance of 200 km from Delhi. And although there isn't much to see in this town, it is a historically rich place. The region has been under the rule of the Delhi Sultanate, Mughal Empire, Sayyids and Rohillas and finally the Marathas. The town is popular for fine basmati rice and mangoes produce. It is also known for the thriving market of wood carving cottage industry. You can shop some of these items when you are passing through the town. Read on to know about places to visit in Dehradun. Also known as Guchhupani locally, is a 600 ft long river-cave that has been formed amidst the mighty Himalayas. The natural cave formation of this place has a narrow gorge that has been formed by congregation of limestone in the Doon Valley. After a trek of about 1 km from Anarwala Village, you may find this secluded escape that is now a popular tourist destination that has been maintained by the state government. Literally translating to "thousand fold spring", Sahastradhara is a stunning scenic place in Dehradun that is located close to the Robber's Cave. The place consists of waterfalls that is called sulphur spring due to the richness of sulphur content that comes from the limestone stalactites, where the water drips from. For a getaway into nature's beauty at its purest form, head to Sahastradhara, which is located about 11 km from the city centre. Mindrolling is one largest Buddhist centres that also happens to be part of the 6 main monasteries of Tibet's Nyingma school. Built by Kochen Rinpoche in the 1965, this Buddhist monastery is particularly known for its magnificent Japanese style of architecture. The paintings found on the walls of the monastery depicts Lord Buddha's life. The monastery remains open from 8 am to 12 pm and 2 pm to 7 pm during summers while it opens an hour later and closes an hour earlier during winter. Dedicated to Lord Shiva, the temple is a popular place of pilgrimage, where the main idol of Shiva is perched inside a natural cave. An interesting feature about this Shivalinga is that you can see water dripping from the cave ceiling and trickling over the idol. The peak time to visit this temple would be during the grand festival of Mahashivratri. The temple remains open from 6 am to 7 pm. Malsi Deer Park, as the name suggests, is a park that is home to numerous beautiful spotted deers. Now the place is also referred to as Dehradun Zoo, since other animals and birds can also be witnessed in this beautiful location. It is spread across a vast area of 25 hectares, a great place for you to take the kids on a weekend.